Home Products Contacts Literature Parts Freight Find A Distributor Help? The Removable Bollard includes one (1) mounting sleeve and one (1) bollard. When access is needed into an area that is protected by the bollard, simply lift the bollard out of the sleeve. Replace the bollard in its sleeve to reinstate the protective barrier. To provide added security, choose the removable bollard with the key lockout feature. 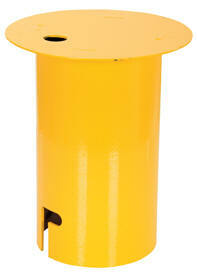 When the bollard is removed, consider the cover sleeve option to prevent debris from collecting in the mounting sleeve. Yellow baked in powder coat finish for added toughness.